Last updated 2 months ago by joereynolds . sql-lint is a linter for MySQL, it brings back any error from the MySQL server as well as custom errors written for sql-lint. There are binaries on the releases page for Mac, Linux and Windows. sql-lint works on queries with the --query flag. > sql-lint --query="DELETE FROM test;"
query:1 Delete missing WHERE, intentional? sql-lint works on files with the --file flag. test/test.sql:40 Delete missing WHERE, intentional? test/test.sql:6 Database 'test' does not exist. test/test.sql:10 Database 'dykes_reservations' does not exist. test/test.sql:11 Database 'dykes_res' does not exist. sql-lint works with stdin if you don't supply any arguments. stdin:1 Delete missing WHERE, intentional? 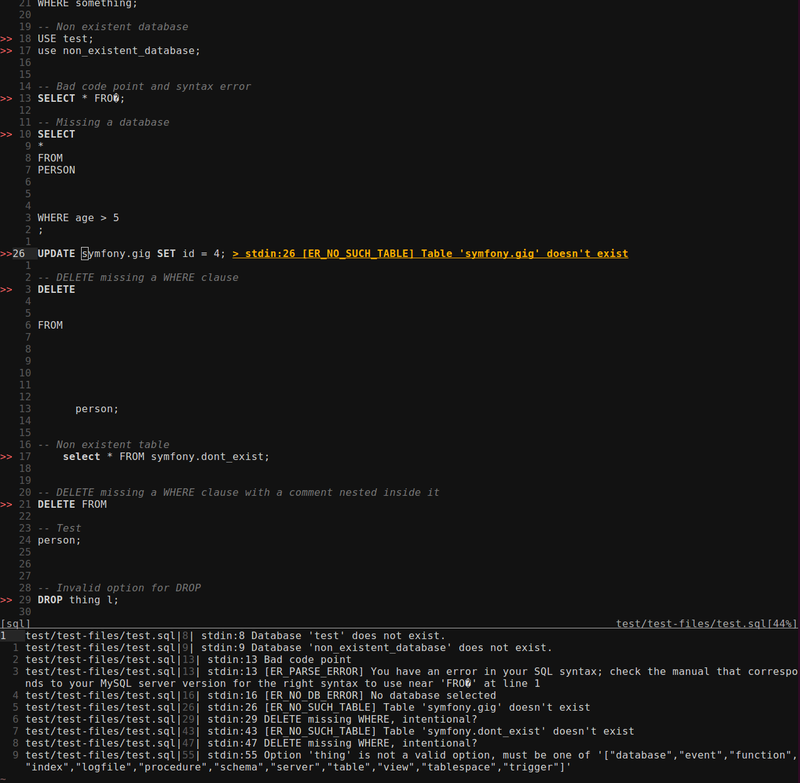 There is a patch here which will allow sql-lint to work with ALE for Vim and Neovim. Configuring sql-lint with connection details allows errors from the server to come through. You'll probably want these as they supply even more information about what's going wrong. You can connect via the command line if you wish with the respective flags. sql-lint --host="localhost" --user="root" --password="hunter2" --query="SELECT 1;"
At this point the container(s) will be up and ready to use. You can login with the following credentials: mysql -u root -ppassword. docker exec sqllint_mysql_1 mysql -u root -ppassword -e "SHOW DATABASES"
Run sql-lint -f your-file and it will display the exception. Add the -v flag for more information. It's telling me there's a syntax error when there's clearly not. Chances are you're using an old(er) version of MySQL. EXPLAINing on INSERT|UPDATE|DELETE was added in Mysql 5.6.